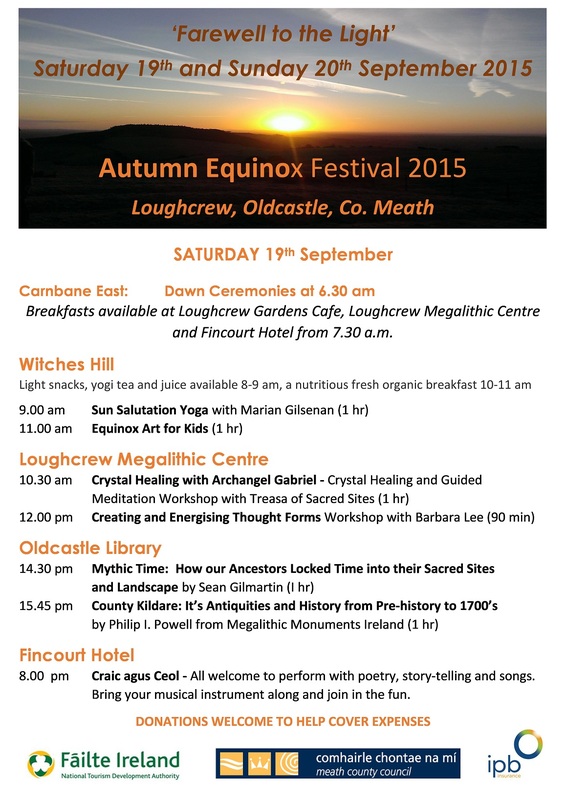 I have added some 2017 dates for Public Full Moon Walking Tours at the Hill of Tara. To see the dates currently available, either click on the Calendar or visit my Eventbrite Page. Absolutely delighted and humbled to have received such a wonderful review of my Sacred Sites of Ireland Guided Meditations from Professor Ronald Hutton of Bristol University. NEW for Summer Season 2016. 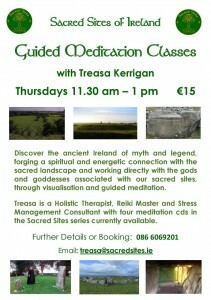 For those who would love to experience Ireland and our Sacred Sites, but are unable to travel here at the moment, Treasa also has Sacred Sites Guided Meditations available from Sacred Sites Shop. 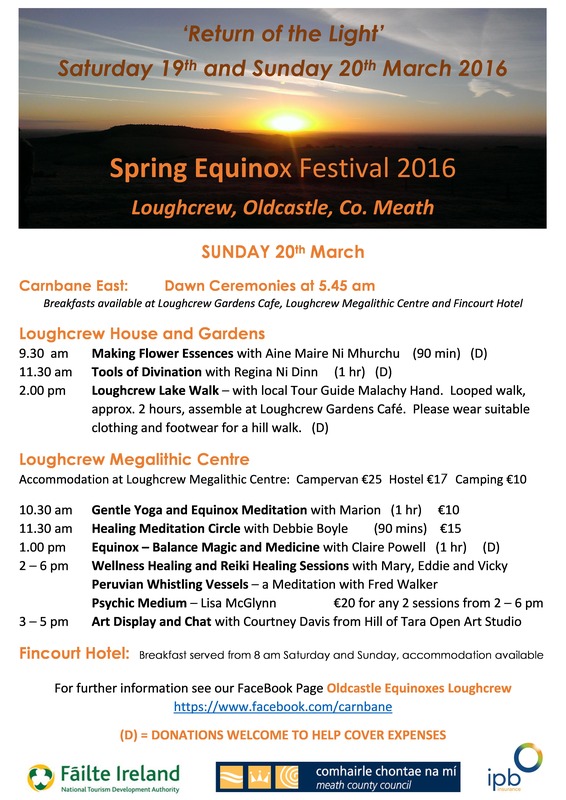 Spring Equinox Festival at Loughcrew takes place on Saturday 19th and Sunday 20th March 2016. 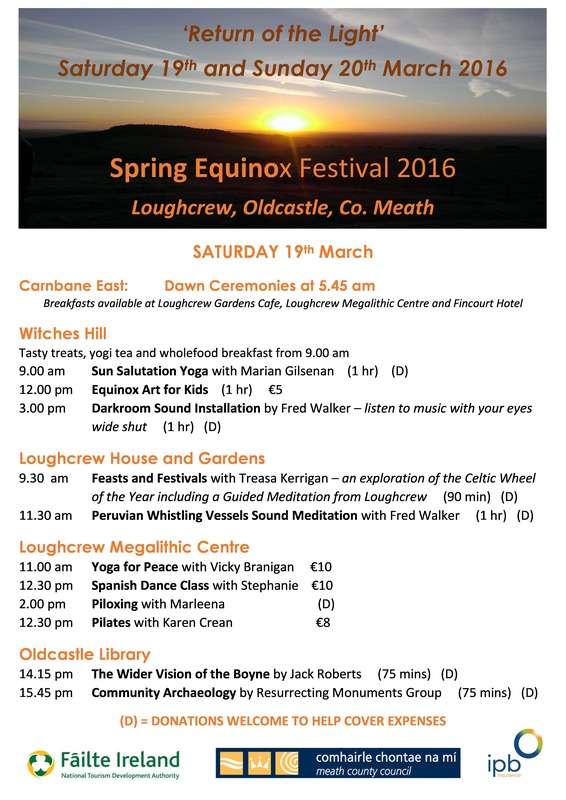 The Office of Public Works will have Cairn T opened for dawn on 19th, 20th and 21st March. The Celtic Ireland summer school at UCC offers a week long tuition on a fascinating theme, as one would expect from a summer school held in UCC, one of the world’s leading universities. All aspects of the subject are covered by a series of lectures, workshops and field trips given by a skilled panel of lecturers at UCC. 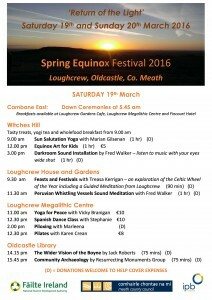 The themes of landscape, folklore, art, memory, festival and sources are described and explained in presentations which will be of great interest to the seeker of knowledge of Ireland’s celtic past. My newest guided meditation Samhain, is now available. This journey takes you to three sacred sites associated with Samhain. 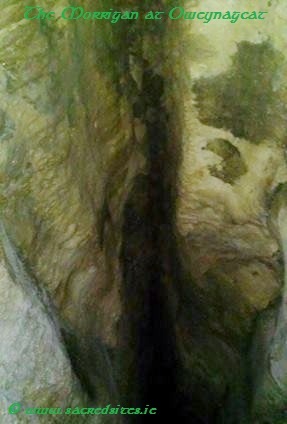 To Oweynagcat, the Morrigan’s cave at Rathcroghan, from whence the Morrigan comes forth on Samhain night, to Tlachtga, where the original Samhain fires were lit and to the Hill of Tara, where the Samhain sunrise shines into the passage tomb, the Mound of the Hostages. 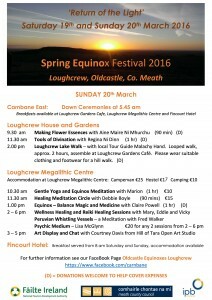 Journey with the ancestors and the ancient gods and goddesses of the Tuatha Dé Danann at this special time of year, when the veil thins between the worlds and spirit walks among us. 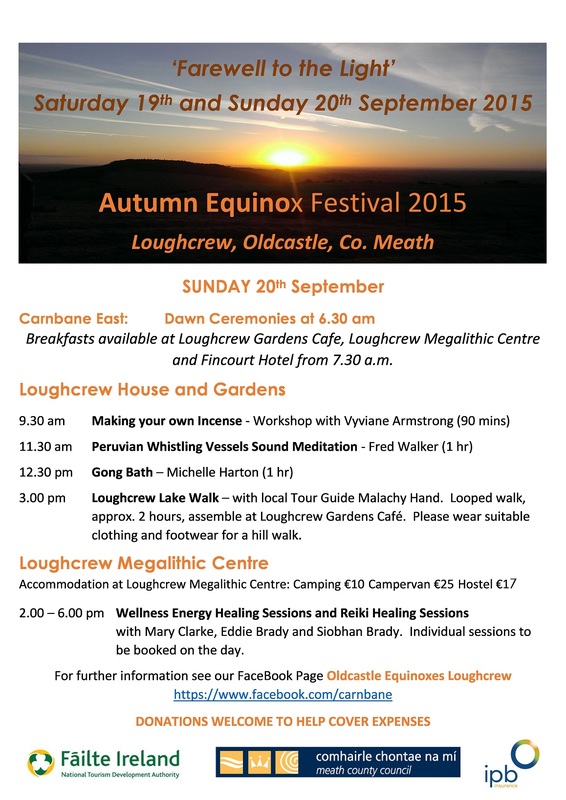 At the Spring and Autumn Equinoxes the Sunrise lights up 5,500 year old Cairn T at Loughcrew, Oldcastle Co. Meath, Ireland. 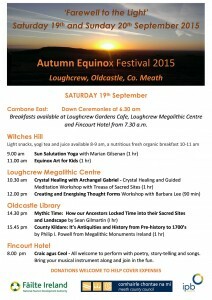 This is celebrated by the Loughcrew Equinox Festival, with Dawn Ceremonies at Carnbane East and events, talks and workshops all day Saturday 19th and Sunday 20th September at Loughcrew House, Loughcrew Megalithic Centre and locations in Oldcastle.